Ross assembles the gang on the roof to watch a meteor shower. They all decide to leave, however. Ross becomes trapped on the roof with Joey; the two try to escape using the fire escape. Rachel and Tag argue over which one of them forgot to send a package at work. 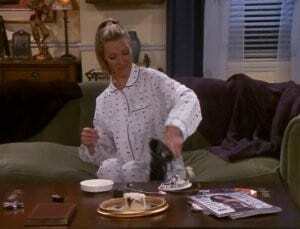 Phoebe’s fire alarm won’t stop beeping. Chandler and Monica can’t seem to fall asleep together, so they keep waking each other up.